Townspeople gathered to watch a steam engine being unloaded at the Sylvan Grove Depot. The train brought the mail and every supply needed to survive in early Kansas. 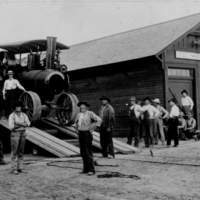 “Steam Engine at Sylvan Grove Depot,” Recollections Kansas, accessed April 21, 2019, http://recollectionsks.org/items/show/728.